The client was facing a challenge of providing a crankshaft to one of it's clients, for which the inventory had exhausted & no more production was carried out by the OEM. 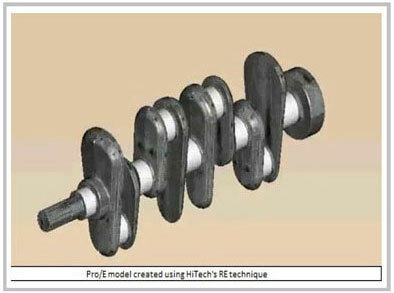 The original design of the crankshaft was not available. In order to complete the engine assembly it was required to reproduce the original design of the crankshaft using reverse engineering techniques. The point cloud data captured was converted into polylines & this data was then imported to Pro/E. With the data, a Pro/E model was created which was used to carry out further analysis of the design & create production ready drawings, once the necessary modifications were carried out. Reverse engineering benefits in obtaining useful design information about components becoming obsolete and have few information available to re-manufacture. It is a vital tool to study the component design in layers of information and identify the effort required to recreate the same. A leading auto parts manufacturer in US was in need of reverse engineering the crankshaft, which was designed to be utilized in vintage cars. Due to unavailability of design information, manufacturing the crankshaft required suitable production ready drawings. To accurately reproduce the design of the crankshaft, firstly all the dimensions were digitized using manual, Laser Scanning & CMM measurement techniques. The Reverse Engineering techniques using CAD/CAM enabled the client to accurately recreate the design of the required part for which inventory had exhausted. This technique augmented the production process by producing production ready drawings. Certain design modifications as per the requirement could be made to make the design more robust.